Frostwater Tundra is a region located in the hold of Eastmarch, which is a part of the province of Skyrim. 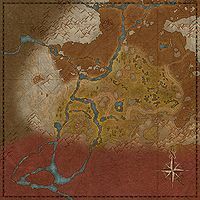 Frostwater Tundra consists of the sulfur pools of Eastmarch, as well as, the hills that border the autumnal forests of the Rift. The stronghold known as Fort Amol serves as the seat of power in the region, as well as, the primary settlement in the land. Minor settlements inhabit the area such as Darkwater Crossing and Wittestadr, but Fort Amol has held much significance than the rest. The ancient keep known as Mistwatch has been used by the Ternion Monks, a religious group who revere the Ancient Nordic Pantheon, which consists of animals such as the Whale or the Eagle.